The most common cause of failure of drainage of the lower urinary tract associated with urothelial malignancy is related to hematuria and AUR caused by the mechanical obstruction of the bladder outflow tract with clot. The patient will present with a variable history: they may be known to have an urothelial tumor, or rarely a renal tumor, or this maybe their first episode of hematuria. Typically, they describe hematuria for a period of time, often associated with severe bladder spasms (as blood is highly irritant to the trigone) cul minating in a complete inability to void, which is almost invariably painful. 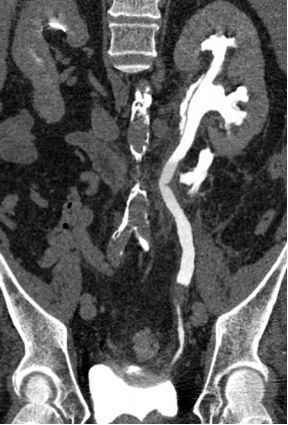 Some patients may have coexisting LUTS, BOO, or BPH, and others may have coexisting detrusor failure or CUR. Examination findings will rarely be different from patients with uncomplicated AUR, but it is important to examine the kidneys to identify any large masses suggestive of renal tumor. If the patient has advanced malignancy, they may be cachectic or show features of secondary disease such as jaundice. DRE may reveal a fixed bladder base mass or evidence of prostatic infiltration or maybe normal. It is important to realize that not all episodes of AUR with clot are caused by malignancy, with common alternative reasons being infection, iatrogenic (instrumentation), bladder calculi, and upper tract urolithia-sis. Acute management is also directed at establishing and maintaining effective bladder drainage. In cases of clot retention, however, it is usually not sufficient to pass a standard two-way catheter, as this will in turn block with clot, even with diligent washouts. The most straightforward means of establishing bladder drainage is via a large 24-F or larger three-way catheter. Irrigating the bladder typically breaks up clots to allow them to be drained more efficiently, and in time all clot debris will be removed from the bladder. In some situations, operative bladder washouts are necessary. Once the urine is clear, the bladder can be inspected and the cause of the bleeding identified and treated, if appropriate, or diagnosed to allow longer-term management to be planned.